The theme's video highlights are hilarious. Clothesline and face mask. How the rules have changed. The NFL Network has been doing some great work with their own documentaries recently. The music is a good mixture of some of the older Tom Hedden and Dave Robidoux orchestral cues combined with some added original material. The late 90's IMHO were when Hedden and Robidoux were at their creative best. They were using 70 plus piece orchestra's and they were winning Emmy Awards along the way for their work. "The Diesel". Big John Riggins. 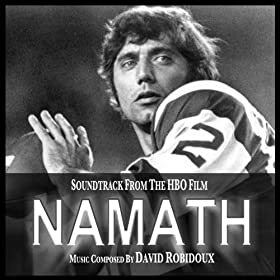 The egos of both Namath and Riggins on the same team were too much for the New York Jets to bear in the mid 1970's. Something had to give, and Riggins moved on to the Washington Redskins and from there on to the Pro Football Hall Of Fame. Just thought I'd share these amusing videos here amongst the group. (Is anyone still here? ) Who would have thought that even the great John Facenda would have trouble pronouncing Fred Biletnikoff's name? Joe Conklin actually does the best Facenda impression I've ever heard. And Joe's Keith Jackson ain't half bad either. Classic Spence and "The Voice" John Facenda. "Sam Spence should be inducted into the pro football hall of fame. His masterful music has served as the perfect backdrop for the replaying of great plays and great games and has provided decades of enjoyment for football fans. Sam Spence is to the NFL what John Williams is to movies." Sam Spence visits UW-Green Bay. Many running backs of yesteryear darted and slashed against the grain avoiding enemy tacklers to the clippity-clop strains of "Range Rider" by Sam Spence. A catchy piece of music if ever there was one. The first 6 discs of the "Autumn Thunder" set are chock full of golden Sam Spence material. There's not a bad apple in the bunch. iTunes seem to have 6 discs of the 10 discs in autumn thunder. For some reason they stopped at 6 over 1.5 years ago. Rights issue or sales? iTunes has 6 volumes of NFL Films of Hedden and Robidoux. Can't find cd versions if there ever were any. Listening to "Round-Up". (I think from disc 5.) A little trivia , this cue was played on King Of Queens, when Dough was trying to beat the record for the most packages delivered without damage. I'm pretty sure they used other cues in another episode. Which got me thinking. Can anyone mention what films or television shows incorporated Autumn Thunder cues? They were usually used for comical montage scene of some sorts. This makes it more saddening to know Sam is not receiving any royalties for these many uses and appearances of his music in shows, commercials, etc. Incredible. I just wish some campaign would be done to pressure the NFL to come forward and explain how on earth they can justify taking Sam's music performance rights out of him. For those of you who are watching the NFL season (go Cowboys! ), Sam's music is being used in VISA commercials and many highlight shows. And, if anyone is in the Bahamas area, he will be conducting some of his music there very soon. Real Football season is here. Time to spin some Autumn Thunder! Alex, the Cowboys are said to have a strong offense and a middling defense. Looks like 8-8 again, but Jerry Jones won't live forever. FSM, when it was a paper magazine, had a big spread on Sam and NFL music, I am not sure I ever actually read it. I think I still have it somewhere. Some of the fun of Autumn Thunder is picking out the "tracked" or "sourced" music. For example Goldsmith's Supergirl theme is very evident. That's not to say there isn't an abundance of originally here. Boy, did you see that beauty of a game last night? The 'Boys ran all over the Saints!! Romo and co. looked great, but what about that defense?? They haven't looked nearly as bad as everyone predicted they'd look. I am definitely getting more excited about this! While I've been enjoying the hell out of Sam Spence's NFL music since this thread helped me discover it last summer, I've collected enough to find some HILARIOUS temp-track imitations throughout. The opening of "Mighty Men and Magic Moments" opens with Resighi's PINES OF ROME fanfare from the final movement and then very quickly moves to a trite-sounding aping of SUPERMAN's title theme, low string "bridge" between the brass/percussion fanfare and all, whilst passing around Respighi's PINES motif. Nice to see that this thread helped you discover the music.